September 04, 2018, 2:00 p.m.
Less than 1% of the American population is descended from Native Americans. As a nation overwhelmingly composed of people immigrants and their descendants, Americans have built a common narrative around shared ideals and a sense of America&apos;s unique position in the world. Data from YouGov Omnibus shows, however, that these bonds may be weakening. 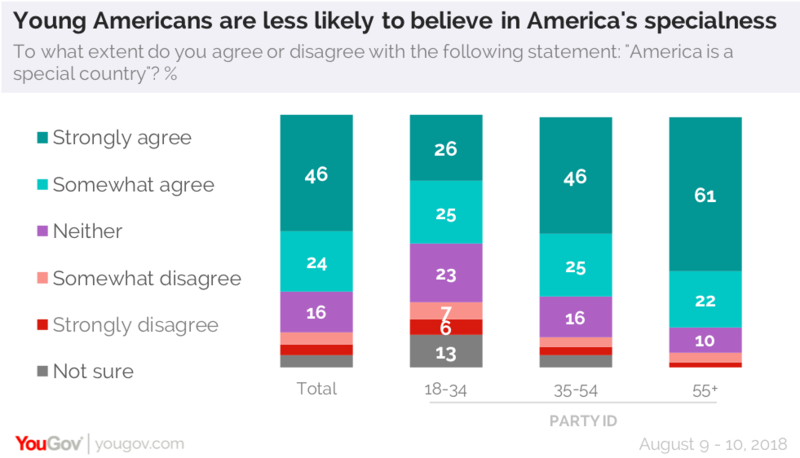 Though a majority of young Americans (51%) say that they think America is a special country, this is much lower than the country as a whole (70%) or 55 and over (83%). A similar divide can be seen between political parties. When asked whether being American is better or worse than being from other countries, 57% of Americans say that it is better, while 26% say that it is neither better nor worse. Among Democrats, however, 37% say that it is about as good to be American as from somewhere else, compared to only 12% of Republicans. Asked whether American ideals or the American people are more important, few Americans say the American people (13%). There is an even divide between those who say ideals (37%) and both equally (37%). Democrats and Republicans are no more likely than the other to divide their importance, though Democrats (16%) are twice as likely to choose the American people as being more important than ideals.